All-New Family Movie - MONKEY UP! This post is brought to you by Monkey Up. Air Bud Entertainment proudly announces an exciting exclusive theatrical debut for the all-new family movie, MONKEY UP. Proceeds from the week-long run at AMC Theaters from January 22 to 28, 2016, will benefit Starlight Children’s Foundation, a leading global charity dedicated to improving the quality of life and health for kids and families around the world. With ticketing also by Fandango, AMC Theaters will show the Dove Foundation certified ‘Family Friendly’ film on 50 screens in top U.S. markets. This marks the first time Air Bud Entertainment has concurrently released a film in theaters and on home entertainment. MONKEY UP will debut on Digital HD January 19 and be released on DVD, February 2, 2016. A hilarious and heartwarming movie for the whole family, MONKEY UP stars ‘Crystal’ the adorable and multi-talented Capuchin monkey that audiences have fallen in love with in dozens of film franchises including The Hangover and Night at the Museum. The exciting new adventure introduces Crystal’s character ‘Monty’ -- the star of Monkey Up energy drink commercials…who dreams of breaking out of advertising to become an A list player on the Hollywood scene. The exciting benefit theatrical run is sponsored in part by Diana’s Bananas, Inc. MONKEY UP is produced by Air Bud Entertainment, the creative force behind the #1 live-action, direct-to-video movies in the family category for decades. The production team has entertained generations with their hugely popular Air Bud and Air Buddies movies. 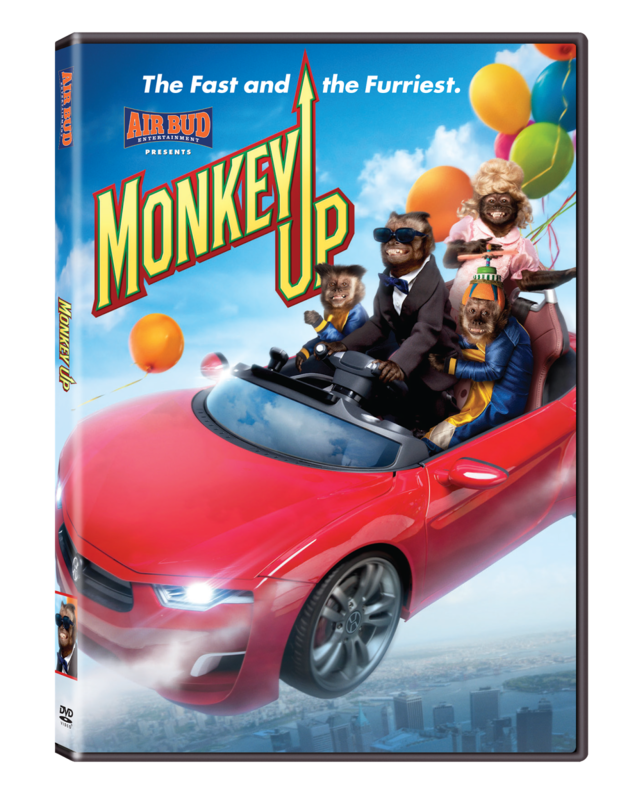 MONKEY UP’s home entertainment release on Digital HD and DVD is through Air Bud Entertainment’s partnership with Alchemy, the leading independent film and television distributor. MONKEY UP marks the first time Crystal the monkey has landed a starring role in a full length feature film. The movie has been rated ‘Family Friendly’ by The Dove Foundation – a recognition awarded to movies, DVDs, made for TV movies and specials, books and other entertainment products that portray and encourage positive values. Joining MONKEY UP primate-star Crystal, are John Ratzenberger (TV’s Cheers, all Pixar films), David Milchard (YouTube sensation Convos with my 2-Year Old), Danny Woodburn (Teenage Mutant Ninja Turtles 2), Erin Allin O’Reilly (Dumb and Dumber to), Jonathan Mangum (House at the end of the Drive) and Skylar Astin (Pitch Perfect 2). Astin is the voice of Crystal in her role as ‘Monty.’ MONKEY UP is directed by Robert Vince. It is written by Robert Vince, Anna McRoberts, Kirsten Hansen and Mary Pocrnic. Produced by Anna McRoberts.